Thanks for dropping back in for the next installment of Baby Steps to Eating Healthier Food! If you missed the first post, click here to catch up. Now that you are armed with a name for your new lifestyle, today we are going to talk about how to stock your house with healthy food. What should you be eating at meals and snacks? How should you accommodate guests and dinners out? Let’s chat about it! 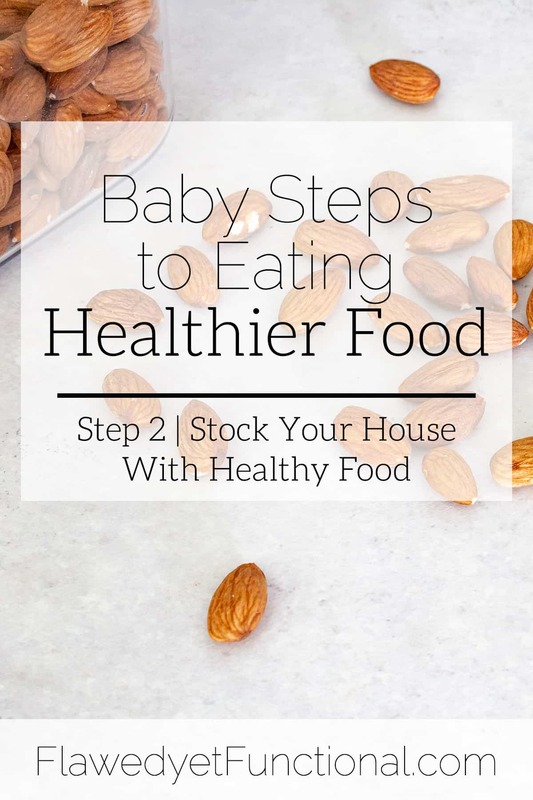 Note: While this is call “Baby Steps” this one requires serious effort and potentially big changes in your food planning and purchasing habits. Keep pushing though! You can learn new habits, I promise! You’ve got a name for your new lifestyle which will help you narrow down the vast number of recipes floating out there on the internet. Now you need to figure out what to eat then get that healthy food in your house! Next make a menu for a week of meals. I’ve spelled out my menu planning strategy in this Menu Planning 101 series. Check that out for 2 different ways to menu plan (one easier, one more in-depth) along with free printable menus to fill out! This step is where the rubber meets the road. Your desire to eat healthier food and change your diet and lifestyle actively starts now. Make the plan so that you will have good food to eat for the entire week and you will be less tempted to deviate from your new lifestyle. Head to the store and buy all the food you need to eat healthy, whole food for one week (Check out this post for more specific guidance.). If grocery shopping for one week feels intimidating to you, cut it down to 3 or 4 days. Plan and shop for whatever seems manageable to you. The goal here is to actually begin eating real food so know your limits and don’t push yourself too far yet. If your house is stocked with whole, real food, you will be more likely to eat whole, real food. I say more likely, if you haven’t purged the junk food, the temptation might still be there (we’ll address that next post!) but at least you will have another option. It isn’t realistic to think you will eat every meal in your house for the week. Take some time to think through your week to account for special events coming up: having guests over and eating out. So you’ve chosen to revolutionize your diet, but you are having friends over, what do you feed them? Will they think you are a weird-o for adopting a Paleo (Keto, AIP, Whole30, etc.) lifestyle? Relax, serve them what you would normally eat. Your guests are coming for your company, not your food. While we all love to eat, if you provide tasty food, no one will balk at lack of buns for the hamburgers. If you are serving something that would normally have a bread product with it (hot dogs, bratwurst, hamburgers, etc.) then explain your new diet and offer for your guests to bring their own if they’d rather have a bun or pick some up for them (but you don’t eat them!). Another idea is to serve something that is appealing to all ages but is a naturally healthy, bread-free meal. Do some brainstorming, you may or may not have to explain your new lifestyle to your friends, depending on how you feel about it. Guaranteed though, you can still entertain and stick to your diet when friends come over. Dining out is also bound to happen, and it doesn’t need to derail your diet. My suggestion at any restaurant is to order a “plain” cut of meat and two vegetables on the side. Does that sound familiar? That’s how I aim to eat every meal at my house! For example, say you are at a steak house, order a steak without gravy, just grilled with oil, salt, and pepper and two vegetables. Most steak houses will have a green vegetable for a side plus baked sweet potatoes. Even if it doesn’t appear on the menu, request a protein (salmon fillet, scallops, chicken breast, pork chop, steak, etc.) with a couple vegetable sides. I’m sure they will accommodate your request! Stay away from the more “fancy” dishes that are multiple things mixed together with various sauces on top. If it is hard to tell what all the ingredients are in a dish, don’t order it. Plain and simple is best when at a restaurant. Baby step #2 requires some work. 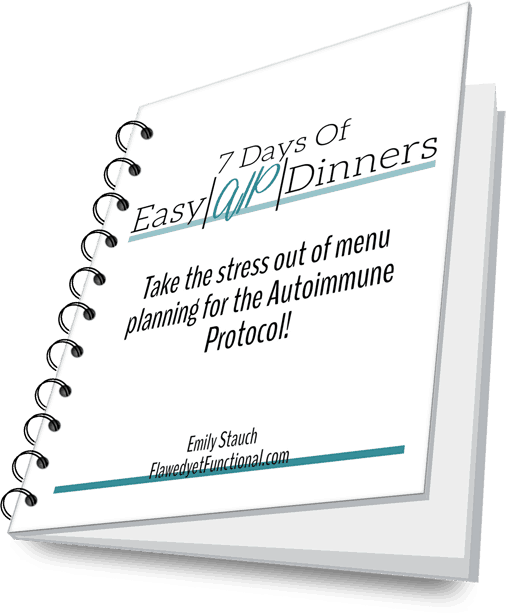 If you are unfamiliar with menu planning and purposeful grocery shopping, this will take a few tries to find your groove. Don’t give up! This is the most important step! In order to eat healthier food, you need to get comfortable with planning what food to eat, regularly shopping to bring it into your house, and planning for special events. You can do it! Stock your house with healthy food today! Are you a menu planning pro or a newbie? How often do you grocery shop? Do you believe if you had healthy options in your house, you’d eat that healthier food?